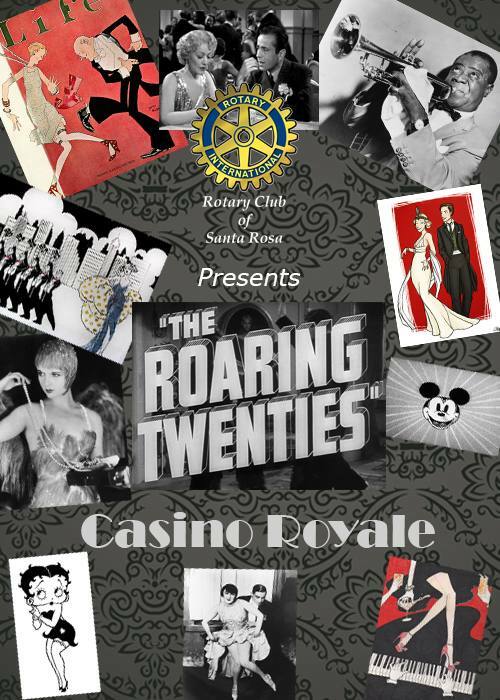 Please join us on January 18, 2014 for a night of fun and games at the Rotary Club of Santa Rosa’s Casino Royale. This year’s event theme is the Roaring 20’s, so come dressed as Flapper, Gangster, a cool couple, or any unique style you can come up with using this theme. We will have a Speak Easy Bar. The tickets sales are coming soon which will include entry to the event, drink coupons, gaming chips and heavy appetizers. Various silent and live auction items will be available at the event. All proceeds go toward our local and international charitable projects. Those projects included, but are not limited to: Dictionaries for Third Graders, Youth in Agriculture, Project Amigo, Rebuilding Together, Rwanda School project, Children’s Christmas Program, Poinsettias for Vigil Lights Senior Housing. Saturday, January 18, 2014, Time: 6 to 11 PM. We are looking for donors for our auction. If you are interested in donating items to our auction, please contact Debi Zaft.